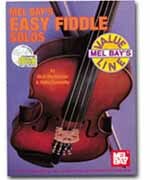 This book of original pieces is intended to give the beginning fiddler an immediate grasp of the fundamentals of fiddling in an instructive yet enjoyable way. The authors assume that the student is capable of reading music in the first position in various keys. Rare in fiddle notation- a tablature system is included with suggested fingerings below each line of music. Melodies are shown with chord symbols for guitar, banjo, or piano accompaniment. A companion CD is included-all at a great price!